Lots of Dots – Just released! Face it, dots are fun. They are fun to draw and fun to see—and even more fun to spot in unusual places. Lots of Dots features one of the most beautiful shapes around—the circle, or dot—and all the obvious and not-so-obvious places that it appears. Clean, bright and graphic illustrations are put to rhyme taking us through a menagerie of scale, pattern and opposites. “Some dots are big, some dots are small. Some dots float, and some dots fall.” Are those buttons or just dots? Are those eggs or dots? And those wheels on that car—they’re dots! Lots of Dots is a visual celebration of observation that promises to make parents see again like kids. This book originated from a random sketch in my sketchbook a few years back. I was playing with stick-on dots with this wacky silhouetted character. I was attracted to the simple isolation of both forms—the figure and the dots. With hope of a theme, I started sketching where dots are apparent. My initial fret was not having enough material to fill 36 pages. Eventually, the images came—as did the rhyming words. I had a lot of fun working with the scale of the illustrations and the coloring. Each final illustration was built from a scanned sketch that was traced and improved in Illustrator. A less-is-more-kind of book. Lots of Fun! Geesh! What a simple idea and a great book. 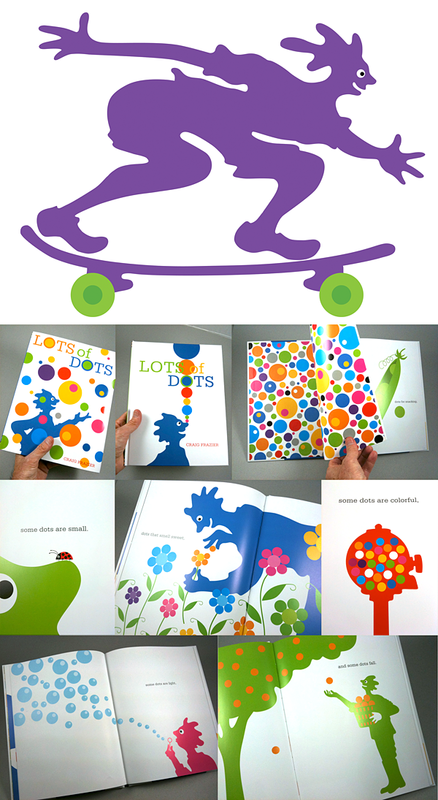 Leave it to Craig to make a wonderfully bright book on simple shapes and words. Always an adventure to see what comes out of Craig’s sketchbook. LOVE the flying purple skateboarder. Luckily, for humanity of any age, Frazier’s zany mind keeps churning out happy books, sparkling with color and originality. That page with the stacked dots on his nose is wonderful! Anyone has the rights to this wonderful book in Spanish? Love Lots of Dots! Our son loved it for a long time and we bought it for quite a few friends with small kids. Plus, it makes a terrific example when I teach about creativity. Delightful. Love your blog!!. It’s wonderful. Thanks a lot for sharing. Your work is great!. Congratulations.